Summary : Yes...the tea looks like dried lawn clippings. So what? If you enjoy lemon teas...and want your lemon in a herbal tea...put aside your fear of drinking something that looks like lawn clippings and give this tasty tea a try. Review : As a general rule, I have no inclination to sample lawn clippings. I mean...who really likes the taste of grass? And the taste of week-old grass that has been left out in the sun to dry....hmmm...yummy. Not! And so it was that I had sort of been finding excuses to sort of put off sampling the Lemon Grass sampler I purchased with my last order with the Dragonwater Tea Company (now out of business). And what is somewhat strange about this whole ordeal I put myself through is that I actually liked the last lemon grass tea I tried! So yes...gretting past the looks of this tea can be a challenge, even if you suspect you'll like it. I strongly suspected I was probably going to enjoy this tea to some degree when I first opened up the package...I was greeted by the nice, but overpowering, fragrance of lemon. Exactly what the doctor ordered on this snowy evening in April. Here is how this tea is described on the website of the Dragonwater Tea Company (now out of business) : "Lemon Grass Tea. High quality dried lemon grass. 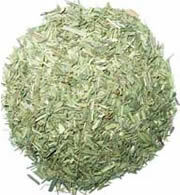 Use as a standalone tea or blend with other herbals. Is has been used to treat gas, fevers, cholic, upset stomach, and arthritis." This tea contains the following ingredients : Dried Lemon Grass. That's it folks...nothing else. The taste of this tea is excellent...at least if you like lemon. Yes...this tea tastes like lemon. Surprised? Well...this tea is made from lemon grass...so what did you expect? Peppermint? And thus we come to the crux of the problem with this tea...if you like lemon...can you somehow summon up the courage to drink a tea that truly looks like week-old lawn clippings? If you can, you'll enjoy the moderate lemon flavor this tea has. Now truthfully, I wish this tea had a bit more "lemon pop" to it, sort of how Adagio Teas Lemon Grass tea has. I found the Adagio version a bit stronger...which for me is good. But perhaps not for you? In any event...if you enjoy lemon tea...you'll like this one, assuming of course you don't mind the odd look the tea has before brewing. Recommendation : Yes. This tea is an ideal bedtime tea that nicely blends peppermint and spearmint to produce a nice, pleasant taste but without any sort of a strong after-taste. And, at least in my case, the Valerian Root in this tea does indeed provide calming properties...as I now find myself wanting to go to sleep! Brewing Instructions : Use one teaspoon of tea leaves. Pour 1 cup (5.5 ounces, but 6 works quite nicely) boiling water over the leaves. Let the tea brew for 5-10 minutes. Culinary Teas Strawberry Kiwi Herbal Tea : If you love strawberries, well then, this is the tea for you. Republic of Tea Chamomile Lemon Herbal Tea : A tasty and highly effective lemon flavored herbal tea that will work wonders in helping you get to sleep.